Nine Ukrainians - participants of the Anti-Terrorist Operation (ATO), who received injuries of varying degrees of severity, will take part in the 43rd marathon of the U.S. Marine Corps this year, the General Staff of the Armed Forces of Ukraine has reported. "On October 25, the Ukrainian team of ATO participants ... leave for the United States to participate in the 43rd marathon of the U.S. Marine Corps, main goal of which is the rehabilitation of the military," the General Staff said on Facebook on Wednesday evening. Ukraine took part in the U.S. Marine Corps marathon two times, where our country was represented by soldiers wounded and injured during hostilities in the ATO zone and underwent more than one course of treatment and rehabilitation. "Nine servicemen and those who will accompany them were invited. 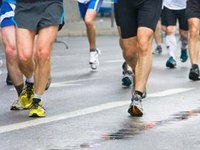 Five of them will participate in the full marathon (42 km distance), the rest will take part at a 10 km distance marathon," the General Staff noted. Andriy Bondarchuk, Dmytro Poltavets, Yuriy Kozlovsky and Oleksandr Darmoros will run a distance of ten kilometers. Marathon of 42 kilometers will be overcome by Ruslan Popov, Bohdan Usharuk, Oleksandr Popruzhenko, Oleh Zymnykov and Pavlo Chaika. The 43rd U.S. Marine Marathon will be held in late October.